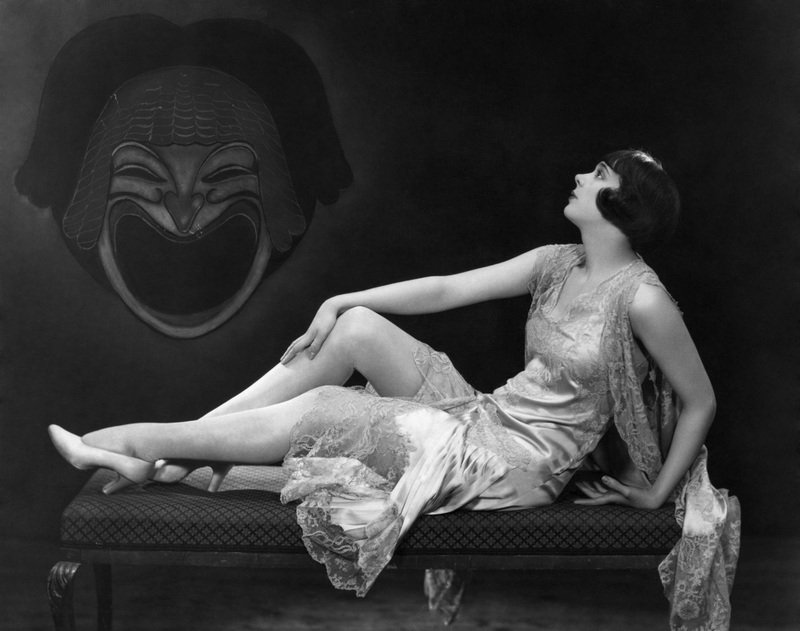 As regular readers of A Shroud of Thoughts know, on many holidays I post classic pin ups here. Since today is my birthday I thought that I would post pin ups of fellow Pisceans (one of whom I actually share my birthday with). Without further ado, then here are this year's pinups. 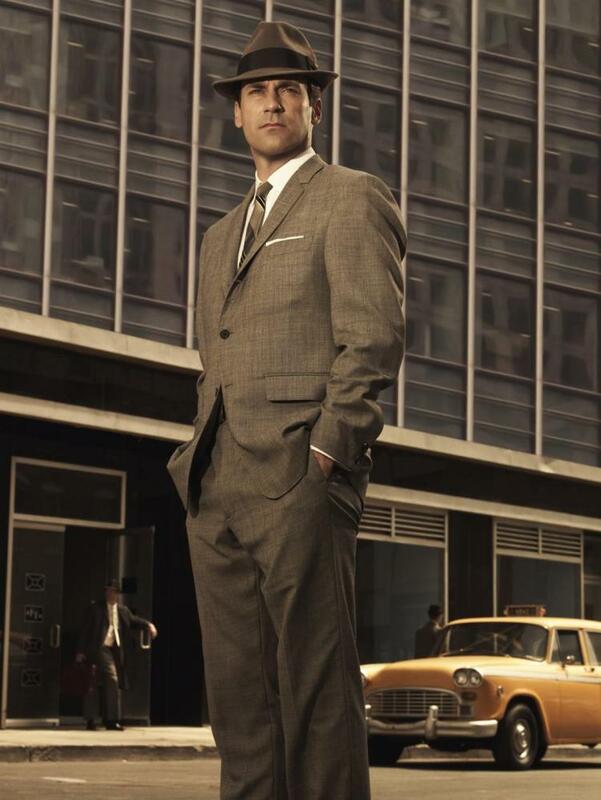 Jon Hamm, who is further proof that the handsomest, coolest men were all born on March 10 in Missouri! It was on April 27 2016 that Turner Classic Movies announced the launch of their first official fan club, TCM Backlot. According to the press release at the time, "TCM Backlot will give fans unprecedented access to all things TCM including exclusive content, never-before-seen talent interviews, archival videos from the TCM vault, an exclusive TCM podcast, as well as opportunities to win visits to the TCM set, attend meet and greets with TCM hosts and the opportunity to influence programming through online votes." TCM Backlot was eagerly embraced by Turner Classic Movies fans, although it presented many of them with one major problem. A subscription to TCM Backlot cost $87. Sadly, the annual subscription cost put TCM Backlot out of reach for many fans on limited budgets, myself included. Fortunately it was earlier this year that TCM announced a monthly plan whereby people can pay only $7.97 a month to be a part of TCM Backlot.. I joined nearly as soon as I got the email. I cannot speak for every fellow TCM fan living on a limited budget, but I know for myself that $7.97 a month was a much more affordable option than $87 a year. Of course, I know many of you might be asking whether TCM Backlot is worth it even at $7.97 a month. I would say that it most definitely is. The archival videos from the TCM vault alone are worth the price of admission. Just this past week I watched the TCM Launch Featurette, several old introductions by Robert Osborne, and the TCM Remembers for Robert Osborne. TCM Backlot also has contests regularly, whereby one can win anything from a visit to TCM in Atlanta to tickets to Fathom Events and TCM's Big Screen Classics series. There also interviews, behind the scenes looks, and much more. 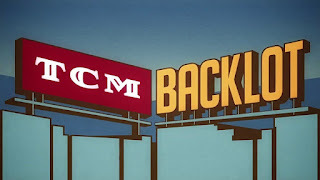 If one can afford the $7.97 a month to join, I highly recommend joining TCM Backlot. When the average classic movie fan hears the name "Gail Patrick", they probably think of her many acting roles in such films as Death Takes a Holiday (1934), My Man Godfrey (1936), Stage Door (1937), and My Favourite Wife (1940). 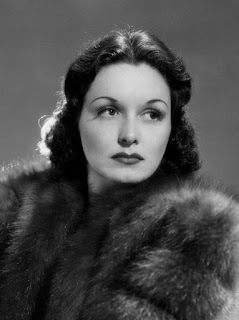 Gail Patrick was not simply a beautiful and gifted actress, however, as she had many other talents as well. In the late Forties, after marrying advertising executive Thomas Cornwell Jackson, she ran her own successful business designing clothing for children for eight years. It would be only a little later that she would make one of the biggest achievements in her life. Quite simply, Gail Patrick Jackson was one of the very first female producers of an American, prime time, network television programme. What is more, she produced one of the most successful and influential shows of all time. The simple fact is that Mrs. Jackson was responsible for bringing possibly the most famous fictional attorney of all time to the small screen. Perry Mason had proven to be a success on radio, but Erle Stanley Gardner was loathe to license the character to television after a series of movies produced by Warner Bros. in the late Thirties proved not to be to his liking. An earlier attempt to bring Perry Mason to television failed after negotiations between CBS and Mr. Gardner broke down (CBS had insisted on giving Perry a love interest, something to which Mr. Gardner strenuously objected). The work that had gone into this prospective Perry Mason series would ultimately be used to create the daytime serial The Edge of Night. It would be due to Gail Patrick Jackson and her husband Cornwell Jackson that Perry Mason would finally make it to the air. Mr. Jackson had been Earl Stanley Gardner's literary agent for many years. Over the years, then, Gail Patrick Jackson would sometimes talk to Erle Stanley Gardner about what he would want a Perry Mason TV show to look like and how much creative control he would want. Eventually Erle Stanley Gardner, Gail Patrick Jackson, and Cornwell Jackson decided to go forward with a Perry Mason TV series and formed a production company, Paisano Productions, for that purpose. Gail Patrick Jackson was president of Paisano Productions and would serve as executive producer on Perry Mason. The show debuted on CBS on September 21 1957. Of course, Perry Mason would prove to be an enormous success. The show ran for nine years. It spent two of those years in the top ten highest rated shows for the year and five of those years in the top twenty five shows for the year. 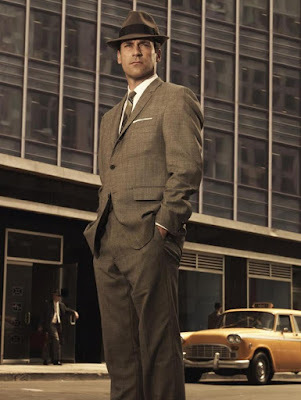 When Perry Mason ended its network run in 1965 it went onto a highly successful run as a syndicated rerun. Today Perry Mason can still be seen on small screens across the country and is available on streaming. As executive producer on Perry Mason Gail Patrick Jackson was responsible for the entire production of the show. She cast the regulars on the show and was even responsible for developing much of its format. It was Gail Patrick Jackson herself who drew up the contract between Paisano Productions and CBS. She was not only one of the first female television producers, but for the nine years that Perry Mason was on the air she was the one of the very few women producing an American network television show in prime time (former movie star Bonita Granville was an associate producer on Lassie at the time and producer and screenwriter Joan Harrison was a producer on Alfred Hitchcock Presents). Gail Patrick Jackson also served as vice president of the National Academy of Television Arts and Sciences from 1960 to 1962 and she was president of its Hollywood chapter as well. She was the first woman to ever hold a leadership position at the the National Academy of Television Arts and Sciences and would be the only woman to do so until 1983. Since the Sixties there have been several female television producers, from Amy Sherman-Palladino to Shonda Rimes, but from the late Fifties into the mid-Sixties Gail Patrick Jackson was one of the very few. What is more, as the head of Paisano Productions and executive producer of Perry Mason, she wielded more power than either Bonita Granville on Lassie or Joan Harrison on Alfred Hitchcock Presents did. In the end, she paved the way for many female television producers to come. If you are British or an American with an interest in the history of popular music, chances are you familiar with NME (short for New Music Express). For those of you who are not familiar with NME, it was a music newspaper that was published weekly for the past 66 years. It became not only one of the most important music publications in the United Kingdom, but by the Seventies it was the best selling British music newspaper. Sadly, NME has announced that it will discontinue its print edition. NME's website will continue to exist, and from time to time they will publish special issues, but the weekly, print edition of NME is no more. The origins of The New Music Express can be traced back to The Musical Express, incorporating Accordion Times. The Thirties saw an accordion craze erupt in the United Kingdom, so that in 1935 The Accordion Times was established. The accordion craze would prove to be short lived, so that in 1946 it had become The Musical Express, incorporating Accordion Times. Over time coverage of the accordion was gradually phased out. Eventually London music promoter Maurice Kinn bought The Musical Express, incorporating Accordion Times. 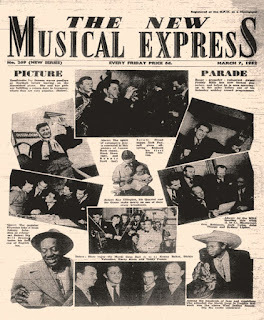 It was relaunched on March 7 1952 as The New Music Express. That first issue featured the Goons, Big Bill Bronzy, and Ted Heath on the cover. 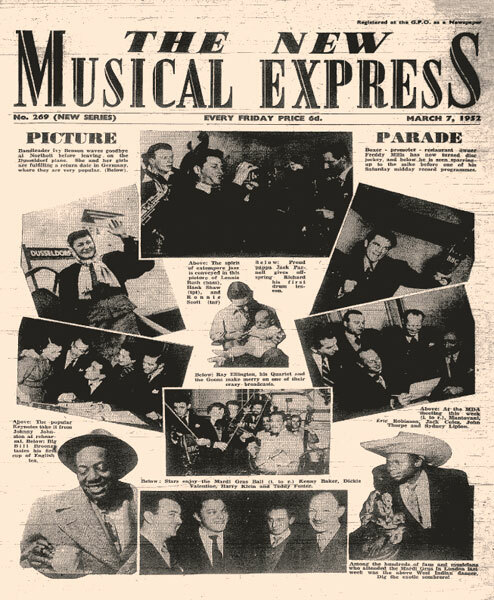 It was with its November 14 1952 that The New Music Express introduced Britain's first UK singles chart. Readers of The New Music Express ranged from a young John Lennon to Malcolm McLaren. It was with the boom in beat music in the United Kingdom in the early Sixties that NME truly came to prominence. In 1964, at the height of Beatlemania, its sales were nearly 307,000. Over the years NME would be the place to read about the various movements in British music. In the Seventies NME was on the forefront of both punk and New Wave. In the Nineties it was on the forefront of Britpop. Over the years many notable people worked for NME. In the Fifties and Sixties future film director Michael Winner was a music critic for the publication. Both Bob Geldof and Chrissie Hynde wrote for NME. Unfortunately NME started to feel the impact on the World Wide Web in the Naughts as readers began switching to digital media. It was on September 18 2015 that NME became a free publication. While NME's website would develop a larger readership than it ever had, increasing production costs would make keeping NME in print difficult. NME the joins a number of print publications that now exist only on the Web. Those of you who are familiar with me might know that I am part Cherokee on my father's side. This came through my great grandmother on my father's side (my grandmother's mother). In fact, both my grandmother and my father looked more Cherokee than they did English or German. As someone who is part Cherokee, I was then delighted to see Wes Studi introduce the Academy's tribute to military films. I was even more delighted when he spoke in the Cherokee language or, more properly, Tsalagi. For those of you are wondering what it was that Mr. Studi said in Tsalagi, the Cherokee Nation on Twitter translated it as "Hello. Appreciation to all veterans and Cherokees who've served. Thank you!" 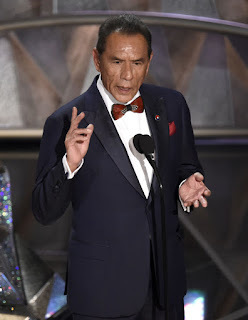 I am not sure that West Studi was the first Native presenter at the Oscars as many news sources have claimed, but I am fairly certain that he is the first person ever to speak in a Native language at the Academy Awards. For those of you who are wondering why Wes Studi speaking Tsalagi at the Academy Awards is significant, one must be familiar with the history of Tsalagi and Native American languages in general. From the 19th Century well into the 20th Century, at Native American boarding schools set up by the United States government, children were actively discouraged from speaking their native tongues, including Tsalagi. If they did so they could be severely punished by having their mouths washed out with soap or even beaten with a belt. Sadly, these policies would reduce fluency in Tsalagi greatly. It has only been since the Thirties that fluency in the language has recovered. Indeed, there are now fonts for Tsalagi available for use on computers and even editions of Windows have been released in the language. I must also point out that, like Wes Studi (who served in the Vietnam War), many Cherokee have served in the military in the United States over the years. Cherokee have served in every single war starting with the American Revolution. In fact, Tsalagi was the first ever Native language used by the American military to transmit messages while under fire. It occurred during the Second Battle of the Somme when a group of Cherokee troops in the 30th Infantry Division (serving alongside British troops) sent messages in Tsalagi in September 1918. It was a tradition that my late best friend and I would get together to watch the Academy Awards each year. Even when we could not do so, we would get on the phone immediately after the ceremony ended and talk about the awards. 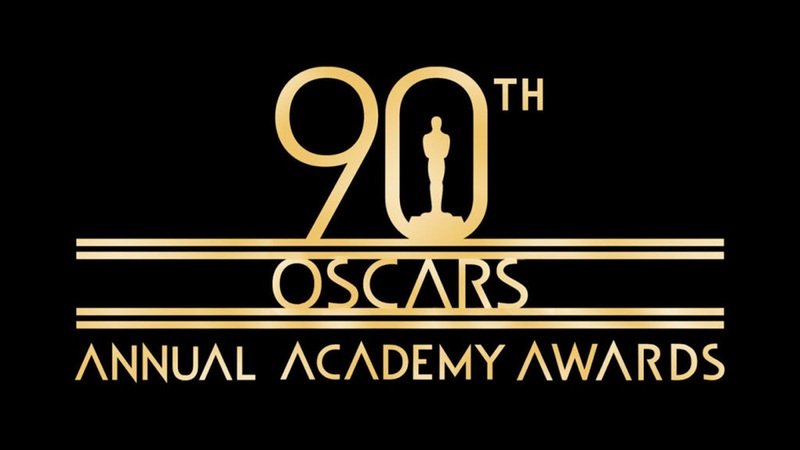 Even now that he has been gone for some time I still watch the Academy Awards even when I have not seen any of the movies nominated for Best Picture (which has been the case the past few years). Generally I am somewhat unimpressed by the ceremony, although I actually enjoyed last night's Oscars. Much of the reason I enjoyed last night's Academy Awards is that the Academy actually acknowledged that movies were made before 1970. The past several years it has seemed to me that in selecting its clips, the Academy has generally not favoured older movies beyond The Wizard of Oz (1939), Gone with the Wind (1939), and Casablanca (1942). This was not the case last night, as among the clips featured last night were ones from Wings (1927), Snow White and the Seven Dwarfs (1937), The Maltese Falcon (1941), To Kill a Mockingbird (1962), Network (1976), and many others. As a classic movie fan it was enjoyable seeing so many of my favourite movies in the various clips. Of course, for me a highlight of the night was seeing Rita Moreno, with whom I have been in love since childhood. It was wonderful seeing her last night, and in the dress she wore when she won the Academy Award for Best Supporting Actress for West Side Story (1961) at that. I was also very happy to see Eva Maire Saint, and I appreciated her tribute to her late husband Jeffrey Hayden. As usual, Miss Saint was charm personified. I also enjoyed seeing Star Wars stars Mark Hamill, Oscar Isaac, Kelly Marie Tran, and BB-8 presenting the awards for animation, particularly when Mr. Hamill kept repeating, "Don't say La La Land, don't say La La Land." Another highlight for me was Wes Studi introducing the Academy's tribute to the military. He was not simply eloquent as always, but eloquent in two languages at that. For those wondering what he said, it was in Cherokee. The Cherokee Nation translated it on Twitter as "Hello. Appreciation to all veterans & Cherokees who've served. Thank you!" As someone who is part Cherokee, I appreciated not only seeing Wes Studi on the Oscars, but hearing Cherokee spoken as well. Too often I feel that Native Americans are overlooked in modern American popular culture. Of course, last night's ceremony was not perfect. I missed a good part of last night's In Memoriam because I broke down crying when they got to Robert Osborne, but I later learned that they missed a good number of individuals who died last year. Among these were Powers Boothe, Nanette Fabray, Lorna Gray, Dorothy Malone (who won the Academy Award for Best Supporting Actress for Written in the Wind), Dina Merrill, Rose Marie, Adam West, and several others (for a more complete list, Sister Celluloid has one here). I realise that the Academy does not want the ceremony to run overly long, but to me the In Memoriam segment is not the place to make cuts. They could leave out performances of the nominated songs and I would not miss them, and I can guarantee many people would not miss the various comedic bits during the ceremony. Indeed, last night host Jimmy Kimmel and several Oscar attendees surprised a group of movie goers at Grauman's Chinese Theatre to express appreciation for movie audiences. While the stunt was a nice gesture and a good way of demonstrating the Academy's appreciation for movie goers, it also ate up valuable time that could have been spent, well, paying tribute to more people in the In Memoriam segment. As to the Academy Awards themselves, I have seen so few movies from last year that I cannot say who deserved and did not deserve to win. I was glad to see Blade Runner 2049 (one of the few movies from last year I have seen) take the Oscars for Best Cinematography and Best Visual Effects. I must also say that I am happy that Guillermo del Toro won Best Director, as I have long been a fan of his work. I am also happy that The Shape of Water won Best Picture. I was rooting for it or Get Out as I thought it would be nice for a genre movie to win for a change. Anyway, I did enjoy last night's Oscars more than many ceremonies I have the past several years. I appreciated the acknowledgement of films made before 1970, not to mention the diversity of this year's presenters. As to next year, I suggest the Academy is more inclusive with regards to the In Memoriam segment (which is something that people have been complaining about for years now) and keep any comedic bits to an absolute minimum. 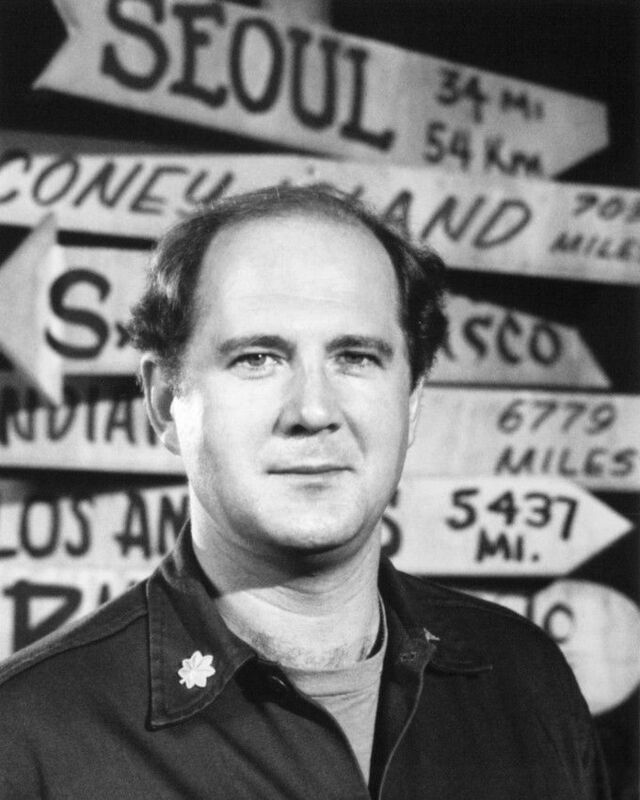 David Ogden Stiers, best known for playing Major Charles Emerson Winchester III on M*A*S*H, died yesterday, March 3, at the age of 75. The cause was bladder cancer. David Ogden Stiers was born on October 31 1942 in Peoria, Illinois. When he was a teenager the family moved to Eugene, Oregon. He attended the University of Oregon for a brief time, and then moved to California. There he worked with the Santa Clara Shakespeare Festival. After several years he moved to New York to study acting at Julliard. He provided the voice of the announcer for the film THX 1138 (1971) and appeared in Drive, He Said (1971). He made his Broadway debut in 1973 in The Three Sisters. In the Seventies he appeared on Broadway in The Beggar's Opera, Measure for Measure, Scapin, Next Time I'll Sing to You, Ulysses in Nighttown, and The Magic Show. It was in 1977 that Mr. Stiers first appeared as Winchester on M*A*S*H. He played the character until the show ended its run, a whole six seasons. He was nominated twice for Emmys for playing Winchester. Prior to M*A*S*H he had a recurring role on the sitcom Doc. In the Seventies he guest starred on the shows Kojak, Charlie's Angels, Phyllis, The Mary Tyler Moore Show, Rhoda, The Tony Randall Show, and The Paper Chase. He appeared in the films Oh, God! (1977), The Cheap Detective (1978), and Magic (1978). In the Eighties David Ogden Stiers appeared in the mini-series North and South and North and South Book II. He began a long run as District Attorney Michael Reston in the series of Perry Mason television movies. He guest starred on ALF, Matlock, and Wings. He appeared in the movies Harry's War (1981), The Man with One Red Shoe (1985), Creator (1985), Another Woman (1988), and The Accidental Tourist (1988). In the Nineties he had recurring roles on the TV shows Two Guys, a Girl and a Pizza Place, Love and Money, and Bull (not to be confused with the current CBS series). He guest starred on Star Trek : The Next Generation; Married People, Jack's Place; The Boys Are Back; Cybill; Murder, She Wrote; Dr. Quinn, Medicine Woman; Ally McBeal; The Practice; and The Trouble with Normal. He appeared on Broadway as the narrator of Beauty and the Beast. He provided voices for the animated features Beauty and the Beast (1991), Napoleon (1995), Pocahontas (1995), and Everyone Says I Love You (1996). In the Naughts David Ogden Stiers appeared on Broadway in Irving Berlin's White Christmas. He was a regular on the shows Teacher's Pet and The Dead Zone, and one of the regular voice cast on the animated series Lilo & Stitch: The Series. He guest starred on Arli$$, Touched by an Angel, Frasier, and Stargate: Atlantis. He was a guest voice on the animated series Justice League, House of Mouse, and Justice League Unlimited. He appeared in the movies Curse of the Jade Scorpion (2001), The Majestic (2001), and Not Dead Yet. He provided voices for the animated films Lilo & Stitch (2002) and Hoodwinked! (2005). In the Teens Mr. Stiers was a regular on The Regular Show. He guest stared on Leverage and Rizzoli & Isles. He provided a voice for the animated film Hoodwinked Too! Hood vs. Evil (2011) and he appeared in the film Neil Stryker and the Tyrant of Time (2017). Quite simply, David Ogden Stiers was a brilliant actor. He will probably always be remembered best as Winchester on M*A*S*H (one of my favourite shows of all time), and he was absolutely wonderful in the role. Major Winchester had an aristocratic demeanour and could come off as a stuffed shirt, but he could trade barbs with Hawkeye and B.J. and ultimately cared about everyone at the 4077th. I don't think anyone could have played Winchester as well as Mr. Stiers did. Of course, he played many other roles than Winchester. I remember him well as District Attorney Michael Reston in the Perry Mason TV movies and Reverend Purdy in The Dead Zone. In movies he played everything from J.W. Harper in Iron Will to the stage magician Volton in Curse of the Jade Scorpion. He was also a great voice actor, providing his voice for many Disney features as well as various animated TV shows. Among his many other talents, David Ogden Stiers also had a great singing voice, which was at times on display both on M*A*S*H and his various Disney movies. David Ogden Stiers might always be best remembered as Winchester, but he did much, much more.